Assuming that you have a barrier coat on, very lightly sand with 80 grit, wash and let dry, then wipe with acetone using a lot of disposable rags. Paint one coat on, then a second coat of a different color so you know when to recoat. 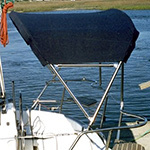 In north Chesapeake Bay waters we have gotten great results with Pettit Hydrocoat. As a bonus, it cleans up with water. You didn't say if you sanded all the old paint off, down to gelcoat, or just smoothed the old bottom paint. If the boat was brand new, or had never had it's bottom painted, you'd want to use a de-waxer or acetone to remove any residual mold wax. Because your boat has been painted before, I'll assume the mold wax is no longer a problem (or the old bottom paint wouldn't have adhered). So, regardless of whether you're down to bare gelcoat, or just smoothed out the the old paint, you're ready to simply apply paint. Of course, if you haven't removed all the old paint, you'll want to be sure to select a paint that's compatible with the old paint. If you went all the way down to bare gelcoat, then now would be the time to seriously consider applying a two part epoxy barrier coat like Interlux, prior to applying your bottom paint. If you're not familiar with that, you'll find plenty of info online. Following the directions on your paints label is highly recommended. I don't have any idea how to "sand lightly" with 80 grit paper.... and it sounds like you've done enough sanding. If you have bare spots to cover... you should consider an epoxy primer to bond the paint to the unpainted areas of gel coat. Otherwise I would just wipe the surface with the recommended solvent (check the paint label or website) and finish with a tack cloth. The roll on the bottom paint. Easy peasy. "Lightly" means just enough to abrad the surface to give the paint some grip but not abrad away and thin the gel coat or barrier coat. I suspect that the po has already done this.